On his Repealless - List. 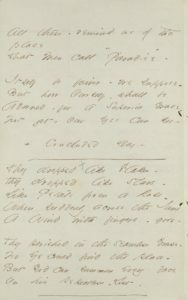 Dickinson skreau dit gedicht yn 1863. Op 1, 2 en 3 july fan dat jier fûn de grutste fjildslach út de Amerikaanske Boargeroarloch plak, de Slach by Gettysburg, dêr’t 51.000 minsken yn sneuvelen. It gedicht waard foar it earst publisearre yn 1890, postúm, ûnder de troch de editeuren tafoege titel ‘The Battle-Field’. F545 (J409). Ofbylding: Houghton Library, Harvard University, Cambridge, MA. YouTube: Dean M. Estabrook, ‘They Dropped Like Flakes’, 2015. 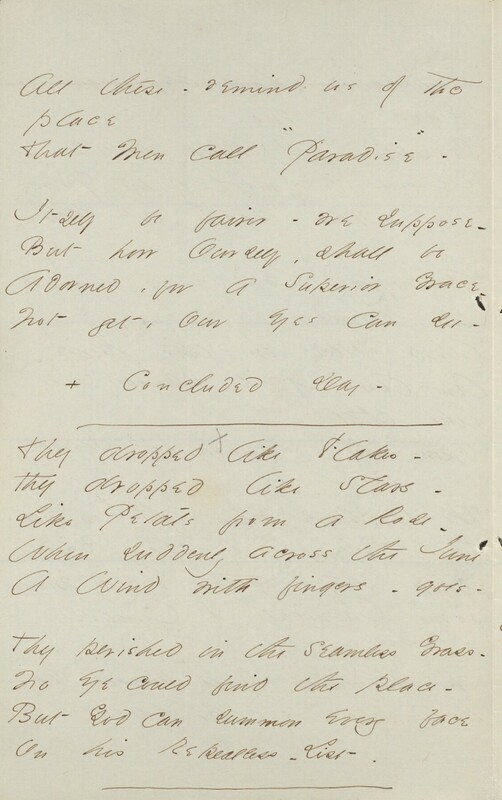 This entry was posted in Emily Dickinson and tagged Dean M. Estabrook, Emily Dickinson. Bookmark the permalink.